Currently the Send message for the creator and the Mark as reviewed processes are intertwined. A reviewer can only send a message to the creator if the page is not already reviewed. And the button to send message to creator also acts as a mark as reviewed button. These two workflows should be separated because often reviewers need to send a message to the creator without marking the page as reviewed (such as when it's still under review). 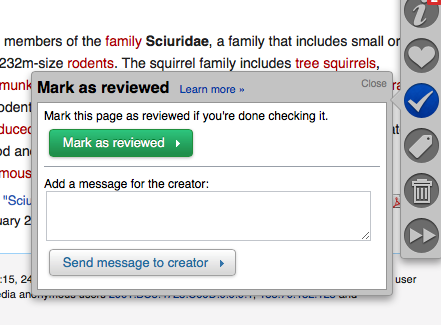 When user hits Mark as reviewed, that only marks the page as reviewed and does not send message to creator. Add a new button Send message to creator which sends a message to the page creator if there is text present in the textarea. The button is disabled if there is no text. Position the elements according the mockup above (with a horizontal separator between the two different steps. The checkmark on the tab turns green only if the page has been marked as reviewed (no relation to whether a message was sent to creator). @Insertcleverphrasehere: Adding MediaWiki-extensions-PageCuration project tag so this task can be found when looking at PageCuration tasks at https://phabricator.wikimedia.org/tag/mediawiki-extensions-pagecuration/ . No need to add team tags like Growth-Team; that is up to each team (or automatic filters). JTannerWMF added a subscriber: JTannerWMF. It appears the CommTech team is working on this.